In Color Order: La Dee Da Giveaway with The Intrepid Thread! La Dee Da Giveaway with The Intrepid Thread! How about we start this weekend off right, with a giveaway! 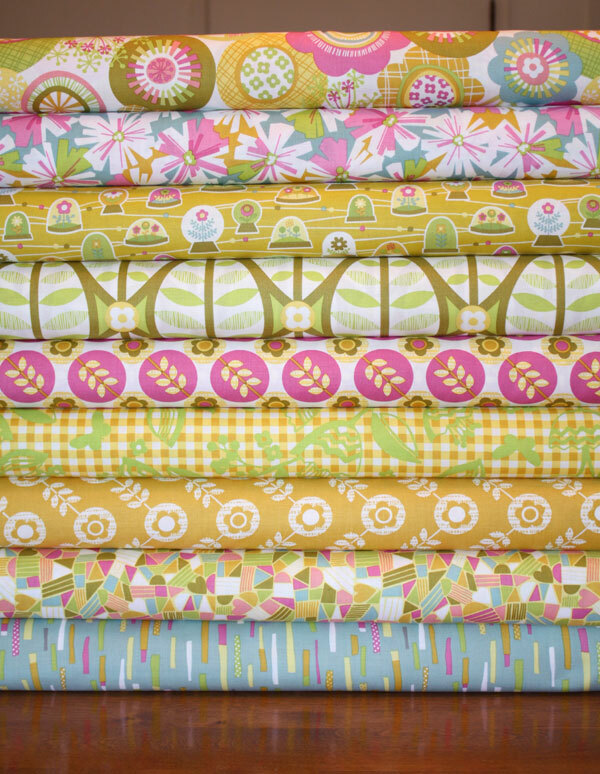 Julie of The Intrepid Thread knows how much I love Erin McMorris's fabrics, so we thought it would be fun to give away a bit of her new line, La Dee Da! To enter just leave a comment! For a second entry, head on over to The Intrepid Thread and let me know what your favorite item is! Come back here and leave a second comment! My favorite item is the Floradots print in Saffron from La Dee Da (go figure!)! They are a fantastic basic and the color is the perfect mustard gold! I love the vintage, mid-century modern feel of her designs! All entries are welcome! Giveaway will end Tuesday, July 3rd at 5pm CST. Winner will be chosen by Random.org. These look like great fabrics...would love to win them. I love Ric Rac Rabbits! 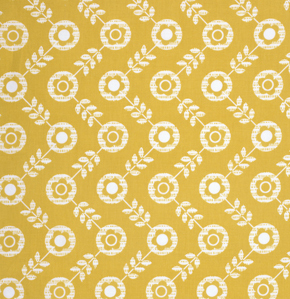 The Bukhara stencil floral in yellow is really nice at The Intrepid Thread. I checked out Intrepid threads, and I love the chevron by Riley Blake, and all of the fabrics with trees..
What beautiful fabrics and colors. I would love to win. I like staflakes and glitter. I love the vintage modern collection the best, especially the pink houndstooth print. I was just drooling over these prints the other day. I have a new pattern from Cluck Cluck Sew, "Pow Wow," that I would love to make in those fabrics! Hello from Poland. I'm not supposed to be checking blogs but I missed you! Alpine woodland is pretty cute. I like Flock - especially Drums in Pink. That certainly is a beautiful bundle of fabrics. Love that stack! Thanks so much for the giveaway chance! I love this fabric! Thanks for the chance! Pretty Little Things is so sweet - I don't think I've seen that before!! Those trees are just adorable! Oh I also love Erin Morris and need some of this fabric! The stack is so pretty - I'd love to win. Mmmmm! This makes me want to sit and sew in the AC!!! This is a beautiful collection! Thank you, Jeni and Julie for the chance to win some!!! Can't wait for the release of The Birds & the Bees -Trees in Pool. It's hard to choose a favorite from Intrepid Thread because she has such good taste - but that's my #1. I have two favorites: Apple of My Eye (which I've already bought) and It's a Shore Thing (which I haven't yet but plan to). I live in southern Maryland, renowned for both the Patuxent and Potomac Rivers and proximity to the Chesapeake. My kids love the beach and would love a quilt made from these fabrics! I love the new lines It's a Shore Thing and Lucy's Crab Shack. Must be the summer girl in me wanting a nice beachy summer! Wow! Great looking fabrics! I would love to win this bundle. Ooooh, I love these fabrics! the colors are just wonderful to look at. And, my favorite item is the collection of Bukhara ~ just wonderful ~ all of it! I love the fabric! Thanks for the giveaway! I love the lucy's crab shack line. I love the plaids! I'd love to win this fabric. Thanks for the chance. Can't chhose just one fav from this line, sorry! What beautiful fabric!! Thanks for the chance to win! I really like a lot of fabrics at The Intrepid Thread. My favorite is Vintage Modern in all the color ways. Would love to win the La Dee Da bundle. I'd love to win a La Dee Da bundle. Wow....great fabrics. Thanks for the chance to win. 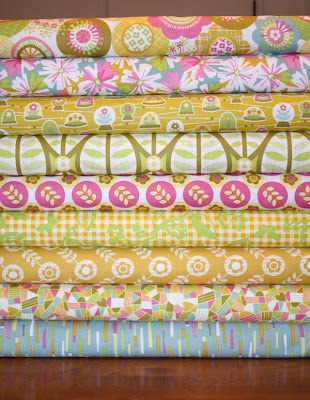 Lovely fabric bundle! Thanks for the opportunity! I love this fabric. I've already purchased some of it and used it on my first quilted pillow case. What a gorgeous bundle! I really hope I win! I've got my eye on Cherry Christmas ;-) Thanks again for the chance to win! Love the Bukhara line from Dear Stella! What a gorgeous stack of fabric! I love yellow yet it is quite hard to ind nice yellow fabric! I love the coquette lacey bouquet in Aqua, it is so cheery. The vinatage modern, cotton blossom in sky, just says pillow for my living room. 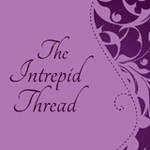 I love the Vintage Modern over at Intrepid Thread. I still need to get my hands on some of that. The colors are just so...mmmmm. Lovely fabrics, it would be soooo nice to win! Pretty Little Things are pretty fabrics indeed! That is such a cheerful fabric collection! Thanks for the giveaway! These fabrics look amazing! I'd love to win!! Oooo...those would be lovely in the log cabin I've been craving to make! Such a pretty stack! I love the Cocoon line in Julie's shop, especially Cashmere in Bamboo. I really like the Dress up days Chevron in blue! I have a little guy here at home that would love some of it. I like the Bukhara collection at Intrepid Thread. That's my favourite too! Love the combination of colour, florals and chevron pattern. So PRETTY! I looovvee Lucy's Crab Shack! Thank you for the chance to win! Yummy fabric bundle. Would love to win this. I Love the Wrenly Christmas fabric. It would make a great Christmas tree skirt. I love Pixie in Aqua. I love the golden color in these fabrics. Thanks for the giveaway. Thank you for the giveaway. I love the golden color of these fabrics. I love the new Quilt Blocks fabric, especially in Marine. These fabrics are beautiful, love them! Thanks for the giveaway! I love The Intrepid Thread...I favorite a lot of her fabric bundles on Etsy. Right now, I'm in love with the It's A Shore Thing FQ bundle in sand and navy. Oh, the summery possibilities! Lovely fabrics, would definitely like to add these to my stash! I love it's a shore thing, especially the sunglasses in pink! Lets see today I am liking Cosmos, Serenade, Sweet Tea, the Birds n the Bees............oh I could go on. But I do need to go back to work today after being on vacation for more than a week, and I don't want to be late. The half-yard bundles from the Intrepid Thread are great, so useful. The Santa Claus is coming to town bundle in Teal would be ideal for a gift for my daughter-in-law! I love the Modern Vintage in Melon at The Intrepid Thread! great giveaway -thanks for the chance to win! I still love Lucy's Crab Shack, but I see they have It's a Shore Thing which is a great line as well. Thanks for another chance to win! So beautiful and so generous! Hope I win! Lovely giveaway. Thanks for the chance to win. Ooh, pretty. Would love to have these to work on small projects in my daughter's room. Amazing giveaway bundle. Thank you! I know it's popular, but I just think the Lucy's Crab Shack prints are so adorable. I really like the Cabana stripes in It`s A Shore Thing. Thanks for the giveaway. This fabric is so wonderful! Pleaase enter me in the giveaway...I could have a lot of fun with this! I like the Nursery Versery - Itsy Bitsy Spider in Gray,Penny Patchwork in Plum and Piggies in Gray b Heather Ross. So cute! La Dee Da is so colourful and pretty. would certainly brighten up my stash. I adore Joy, the line of Christmas fabrics at The Intrepid Thread. I like the lillybelle lacis - thanks for the chance! wow id love to get my hands on some of this! thanks so much! I love all of your tutorials and inspiration! at Intrepid Thread's site I really love "Trees in Cream" ... beautiful! My fav item is Lucy's Crab Shack - Trunks and Tops in Ocean. Really cute! Oh, i love Pretty Little Things...so sweet! what a lovely prize, count me in! my favorite item right now is a Lucy's Crab Shack FQ bundle, I am totally in love with that fabric! This line is gorgeous! Thank you for the opportunity to win part of it! WOw what a great stack of fabrics!! Fingers crossed for me - I would LOVE to win all this yummyness! Oooohhhh! You know I could use some more fabric!! Thanks for the giveaway!! My favorite intrepid thread fabric is Bukhara - Fez in Multi. I am addicted to anything Ogee patterned!!! This is very easy! The fabric is so beautiful and I needed for the quilt I am finishing up. Oh well I obviously love the colors! Julie is always making me drool over her fabric bundles. Loving Snickerdoodle in Pear - that fabric rocks!!! Great giveaway!! Thanks for the chance! Great way to start the weekend! Thanks for the giveaway! These fabrics are gorgeous! I would love to win. They remind me of the vintage sheets you work with, Jeni! I'll be back with my favorite item soon. I've visited and found I like Desert Daydreams Coffee Beans in Violet. Thanks for the giveaway. Hope your summer is going well. Thanks for the giveaway. Looks like fun fabric. Second entry - my favorite is "Mama Said Sew - Sewing Guide in Cream and Black"
First entry: I love those colors! I love the chocolate pearl bracelet, but I love all the pearl bracelets! So colorful! Thanks for the giveaway! I love the "It's a shore thing - Sunglasses in Blue" how fun! The whole "it's a shore thing" collection is super cute, I also love the flip flops! Great fabric! Thanks for the chance to win! Second entry: I love the Rhapsodia, and Bukhara collections. I'm a hippie at heart. I cannot wait until the release of "Coquette"! Love, love that fabric!! I would love to win! I need more yellows in my stash! I love Erin's fabric, so this is really exciting to me. Okay my fingers and toes are crossed. What a great giveaway - that mustard is wonderful! I had a peek over at Intrepid Thread, and I love the Rosettes in Snow from the Wrenly Christmas range by Valori Wells. I think it would make a lovely tonal blender - it doesn't look Christmassy to me on its own. I really like the la de da fiddlesticks in grey. I would absolutely love to win this fabric, the colors are beautiful. I am posting this on my blog. Thanks for the giveaway. I like the desert Daydreams dancing shrubs in turquoise! I really like the Joy - Laughing All The Way material. What a happy collection of fabrics. Love these frothy, light colors! Wonderful! what cute colors! thanks for the giveaway! Oh, yes! I'd love to win. What happy fabrics these are! I love ordering from Julie! I'm lovining Serenade right now. The butterfly prints are wonderful! Wow, shat pretty colors. Thanks for the giveaway. Maybe it's because it's summer, but I am loving the It's a shore thing line, especially the beach umbrellas. Oh, I love these fabrics and I almost bought them too! Thanks for the chance to win. I checked out the Intrepid Thread and am in love with Bukhara Henna in Multi! What a great assortment of fabrics. Thank you for sharing this site with us. Great looking fabric, I would love to win them. I've already ordered a fat quarter bundle of the whole line from Julie, but more would be awesome! Happy long weekend. I am loving Lucy's Crab Shack. The clothes on the line are so perfect for summer. And the plaid. And the bikes. I love them all! I'm obsessed with la dee da and have big plans for the bundle I've ordered! Thanks for the giveaway. I love all the prints in the Lucy's Crab Shack line. If I had to pick a favorite, though, it would be the kite ties. Beautiful fabric! I would love to get my hands on it! Yes please, those look beautiful fabrics! This is such a fun line! Perfect for some sewing for my girls! My favourite item is Foliage in Pink from Outfoxed - I`d love to use that for a quilt backing. Love the fabric. Really love saying the phrase "La Dee Da." Thanks for another giveaway--love that collection! I really love the Picadilly bundle in those gorgeous pinks! I loe all her fabric and this is too cute! Hard to pick just one fabric from The Intrepid Thread!!! I'd have to go with Fiddlesticks in Aqua -- part of the La Dee Da collection -- I could think of a dozen things to do with that print! #1 -Of course I would love to win to restock my stash which is quickly dwindling! Thanks for having an amazing giveaway! Hello! My choice is "Apple Of My Eye"! Thanks to you+Intrepid Thread for sharing! Nice, cheerful fabric that I would love to own. The colors in this bundle are to die for. #2 Floral Elements in Iris or Tangerine, I love purple and orange and both of this would be amazing! My favorite item is FLOCK at Intrepid Threads. Scrumptious! What a great giveaway!! I would love to win! Second entry - so much to choose from, but I really love the Shelby in Pink pattern from Pretty Little Things. I like Vintage Modern. Thanks for the chance to win!! What wonderful colors. Great giveaway.